“Time Bomb” is a solid episode, dovetailing an advance of Illyria’s arc while neatly resolving some of the lingering problems she presented. As an antagonist, Illyria was great; after brutally murdering Fred she’s established as a remorseless demon lord with godlike strength and intelligence, the ability to manipulate time and space, and possibly talk to plants. She was someone we were definitely interested in seeing our heroes fight. But, with the fight over, where does she fit? That’s the central question of Illyria and what makes her such an interesting character but the things that made her a great villain also make her integration with the team impossible. This story is about very human heroes; it’s not big enough for a god, so how can Illyria remain a part of it? The problem’s effectively encapsulated at the top of the episode as Illyria waltzes into the prison dimension that nearly killed Angel & Co. and waltzes out with the number one prisoner. Just as Angel and Wes are discussing why she’s still hanging around Wolfram & Hart and how she might possibly fit into the team, she bursts in with Gunn in hand and makes a dramatic point regarding how much they owe her. 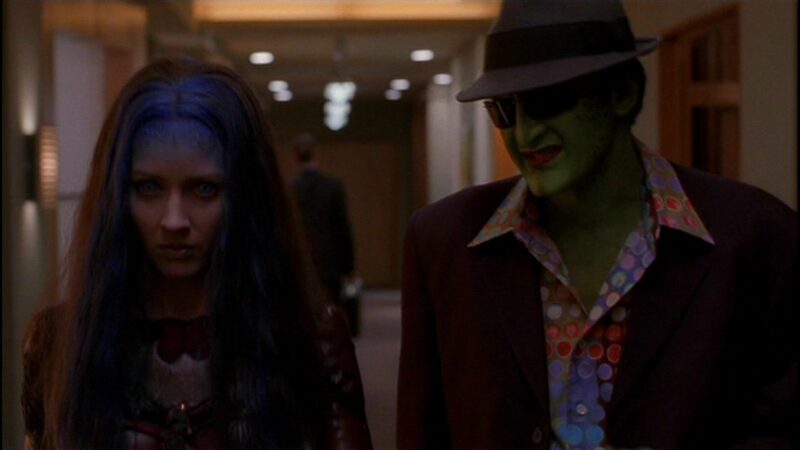 The tension here keeps Illyria from becoming a complete get out of jail free card, but it’s not something that can be sustained over the long term from both the audience’s perspective and from Angel’s as he recognizes that she needs to be dealt with. Dealing with Illyria means making her vulnerable. She’s been a fish out of water since she arrived but her increasingly erratic behavior goes beyond that. Wes’ theory that her psyche’s deteriorating along with her physical form is plausible but the accuracy of her ravings suggests there might be more going on here, a fact confirmed once we learn that she’s moving back and forth through time. It’s not a new conceit but the episode does a good job with it, waiting until the latter half to give us insight into Illyria’s perspective. She really is coming apart, though not entirely in the way Wes thinks. She’s stung as much by his apparent betrayal as by the fact that a pack of mortals might pose a threat to her and she doesn’t know how to cope with this frailty. This fact is what makes the depowering of Illyria more than just a narrative convenience. When Wes reveals he doesn’t actually intend to kill her, she responds, “You want to take my power to let me live. But I am my power and I would rather be a titanic crater than be like unto you.” However powerful she may still be after getting hit with the magic ray gun, she’s not the limitless god she once was and this change solves the narrative quandary of the character that can solve any problem while also giving her a proper place in the ensemble. So much of Angel is about dealing with one’s past and, now that Illyria’s been irreparably separated from hers, she can join the club. Where omnipotence isn’t much of a story driver, ex-omnipotence certainly is. Amongst all her raving, Illyria manages to give Angel some needed insight into what it means to rule. The decision to hand over the baby is a bit of a stretch but, if you buy into it, her advice works on multiple levels. We know in retrospect that Angel hasn’t really gone over to the dark side and that Illyria’s really just given him an illustration of how Wolfram & Hart thinks. For both her and the firm, power is an end in itself. As a viewer, the suggestion that Angel’s suddenly embraced that philosophy doesn’t really ring true, but I can believe that W&H bought into the deception; their outlook is so thoroughly ingrained that they can’t really understand any alternatives. From their perspective, Angel’s simply coming to his senses. The other way to look at Illyria’s advice is that Angel really has embraced it, just not in the way the firm thinks. She sneers at his morality, saying a rule “is as moral as a hurricane, as remorseless as a gale.” Sacrificing an infant the bottom line certainly falls into this category, but so does pretending to do so. Even if he intends to save that baby, putting it at risk is a level of ruthlessness we haven’t seen from Angel in some time. Forsaking morality may be what Wolfram & Hart wants, but it may also be what it takes to beat them. Lorne actually gets something to do this week, even if it is just comic relief. He deserves better, but his tailing Illyria was pretty great. This entry was posted in Angel, Season 5 and tagged Angel, s5e19, Time Bomb. Bookmark the permalink.